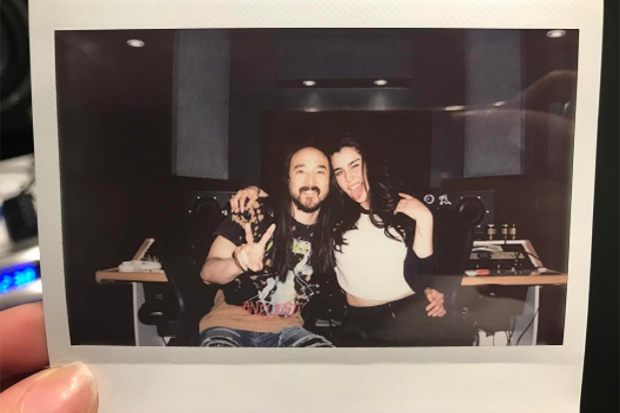 Is Lauren Jauregui Working On Solo Music? Lauren Jauregui could be the next Fifth Harmony member to release solo material. What is it with Steve Aoki and boy band/girl group members? The veteran DJ scored the biggest hit of his career last year with “Just Hold On,” a collaboration with One Direction’s Louis Tomlinson. He’s now going for the double by joining forces with Fifth Harmony’s Lauren Jauregui. They hit the studio last night (February 14) and shared a couple of pics on Instagram. There’s not much else to go on apart from the captions “so excited” and “big things coming.” Steve also added a couple of fire emojis. Of course, this isn’t the first time Lauren has stepped out on her own. She recently featured on Marian Hill’s “Back To Me” and has been working on songs with The Rascals (the producers behind Ariana Grande’s “Tattooed Heart”). Don’t worry. The 20-year-old is not about to leave Fifth Harmony any time soon. The group recently renegotiated their contract with Epic Records and their third LP is due later this year. That doesn’t mean the vocalist, who came out as bisexual in an open letter to Trump supporters, can’t work on a couple of side-projects. Are you excited for Lauren’s club feature? Let us know below, or by hitting us up on Facebook and Twitter!